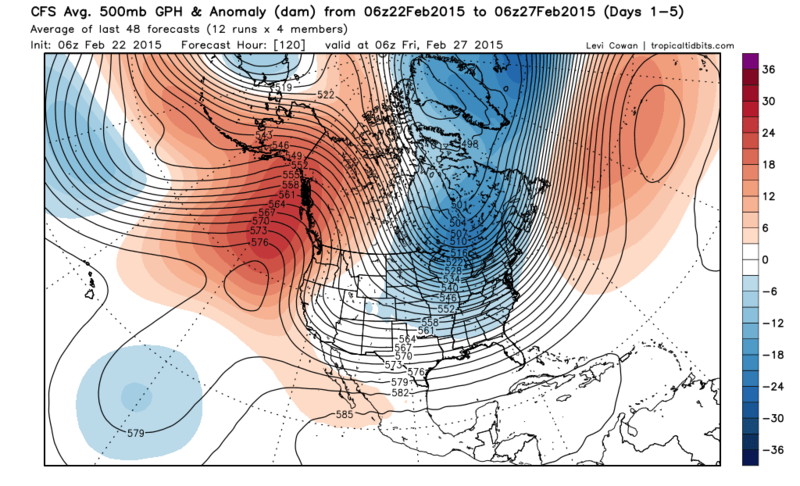 Midwest Winter Weather Blog: Persistent Alaskan Ridge to Favor More Cold Blasts, maybe a storm? Persistent Alaskan Ridge to Favor More Cold Blasts, maybe a storm? More of the same on the way for much of the United States, cold, and substantial cold. All time records are in danger yet again as we start this next work week, especially around the Ohio River Valley. The general pattern over the next 10-15 days will feature a massive ridge over the Pacific Ocean. This will allow multiple shots of cold, arctic air on the same caliber as the past 10+ days to filter into the US. As storm systems continue to pass into the north Pacific, warm air is ushered north. As a result, the flow pushes the jet stream north. Since the Polar jet acts like a wave, any perturbation must be felt down stream. In this case a massive trough sets up in the eastern half of the country. The attached map shows the geopotential height anomalies off the GFS model, a good indication of where troughs and ridges will likely set up. The warm anomalies can be thought of as ridges, and cold anomalies troughs. The CPC agrees with continued cold air across much of the CONUS over the next 8-14 days. This pattern is similar to the one that set up in January last year. Luckily, we are heading into March, so the sun angle is higher in the sky and "Polar Vortex-like" temperatures will not be seen. However, departures from average will be extensive, and there will be nothing Spring-like about the next two weeks. It has been generally dry, or snow free in the Midwest over the past month or so. This can be attributed to the northwest to southeast flow. Alberta clippers can form on such a pattern, but they are usually moisture stricken, as their origin is in a cold dry area of Canada. Meanwhile, the east coast was orientated directly in the active storm track. There is a potential that we could head into a more stormy pattern, in the Midwest. Some models suggest the trough to push far enough west and high pressure to build off the east coast. This would allow the jet stream and storm track to set up through the Great Lakes, with snow to the west of the storm track. 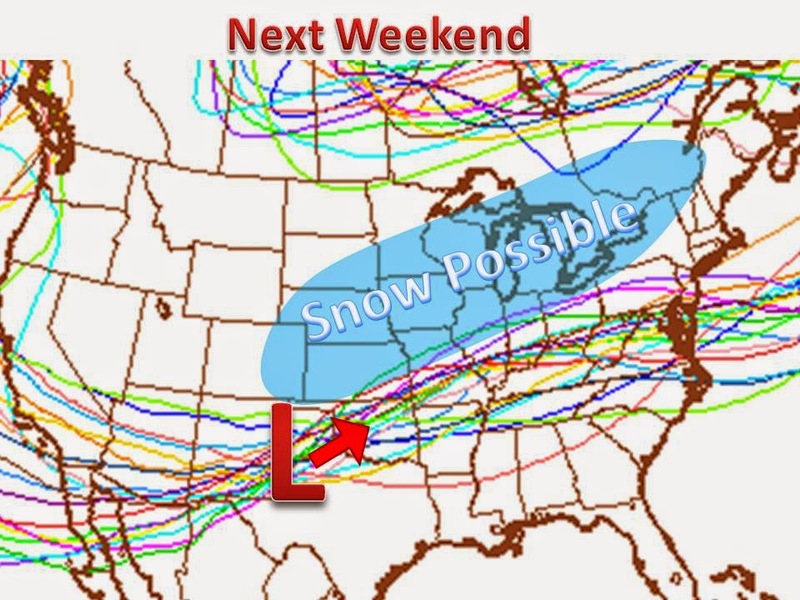 This would be very favorable for winter storms and cyclones in the Midwest. 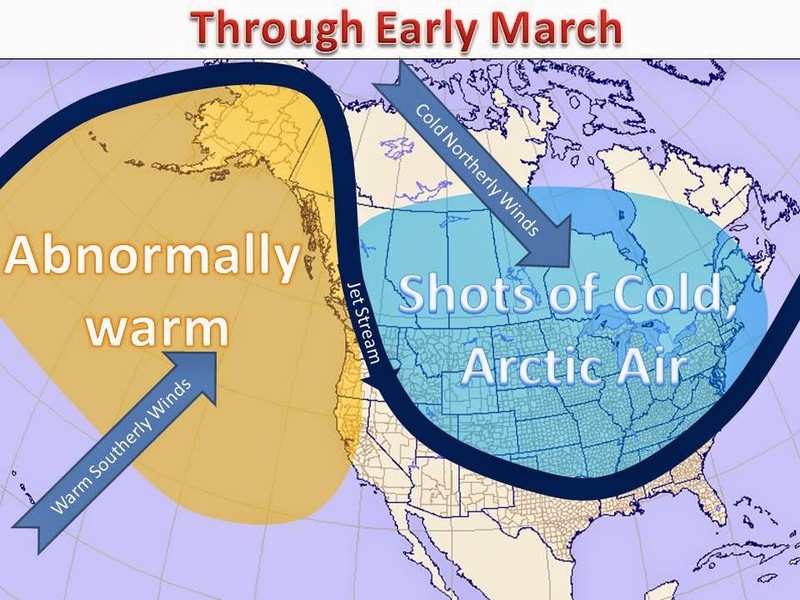 It would also signal warmer weather for the east coast. Our first opportunity of this change comes in next weekend. The European and american models are showing decent snow across Iowa and Wisconsin, as a storm system and substantial line of baroclinicity sets up. We will need to watch this closely and provide updates, as needed if these storms come to fruition.